As you are probably aware, we do a lot of work for various local animal charities. One of these is the Preston branch of Cats Protection (CP). 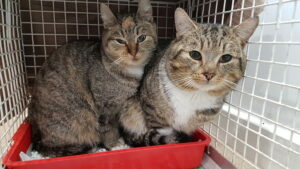 Any cats they are taking on to rehome come to us where they have a full health check, blood tests, neutering (if not already done) and anything else they need to start their new life as fit and healthy as possible. Recently, we had two cats brought in, Shadow and Pagan. Shadow had his right foreleg missing from the elbow down and a lump on his abdomen. We initially thought he might have had an accident which had caused these injuries but when we anaesthetised him we could see his heart beat (and feel it) through his abdomen. This is very unusual so we decided to do some X rays. 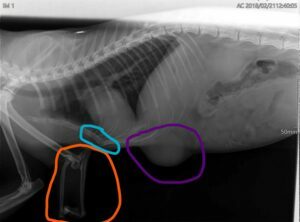 Radiography showed that his front leg is a genetic malformation which he had had from birth, you can see the bones of the leg (circled in orange) are very different from the other leg (which is in front of the abnormal one). His heart is enlarged but he has a deformity in his sternum (circled in blue) and the swelling on his abdomen (purple) is a fat hernia which contacts directly with the heart so we can see (and feel) the heart beating. 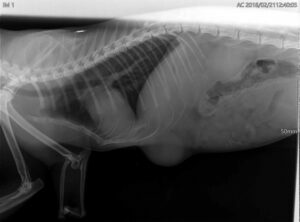 You can also see his microchip in the top of the image. We had not seen before such a strange combination of genetic variations. Shadow seemed healthy and happy with his sister, Pagan, so no treatment was required and he will now move on to a new home. Every day we see things that are a different from what we have seen before, there are always new challenges ahead. Shadow illustrates this very well and surprised all of us when we took the X rays! Can you see through our X rays? Ollie gets dragged through the fence!